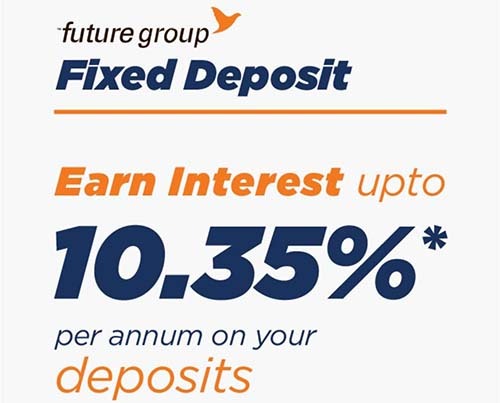 Future Group Fixed Deposit is a program under which Future Enterprises Limited (FEL), the flagship group company of Future Group, is raising Public Deposits under section 73(2)(a) and Section 76 of Companies Act 1956. What are the benefits available under Future Group Fixed Deposit? The Fixed Deposit scheme offers an Interest rate of ‘upto 10.10%’ on your deposits with an additional 0.25% Interest if you are either a Future Pay Member, a Big Bazaar Profit Club Member, Company Shareholder or a Senior Citizen. Who can invest in Fixed Deposit? Any Resident Individual, Company, Partnership Firm, HUF, Trust or Foundation can apply. Why should I Invest in Future Group Fixed Deposit? The FD offered under the scheme brings you high returns with high safety. With Interest rate of ‘upto 10.10% p.a. (for 3 yrs. cumulative scheme) and CARE rating of AA- (FD) Outlook Stable, our Fixed Deposit ensures you safe and best returns on your money which is superior to other fixed returns investment options. What are the schemes available under Fixed Deposits? How and where I Can Apply for Future Group Fixed Deposit? Till when Can I invest in the scheme? The investment options available under the scheme are for 1 year, 2 year and 3 years. The scheme is available for a limited time on a first come first served basis and is subject to change. How to Apply for Future Group Fixed Deposit? To Open Future Group Fixed Deposit you can visit nearest Future Group Stores like Big Bazaar, fbb, Central, or Brand Factory. Fill in the Application Form and submit it by enclosing your identity proof and address proof documents. You will need to provide the funds at the same time of which you want to book fixed deposit with Future Pay. Once your FD is booked you will be provided with Fixed Deposit Certificate which you will need to keep safe with you. And once your FD matures you will need to furnish this receipt to Future Group to withdraw matured funds. Alternatively you can give miss call on 022-50806444 And you will be guided with further instructions, on how to book a fixed deposit with Future Group.